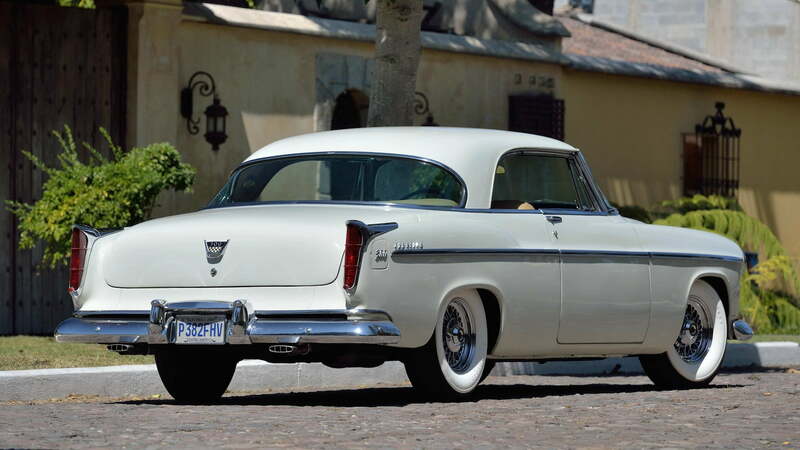 The 1955 Chrysler C-300 was arguably the first of America’s “muscle cars”. 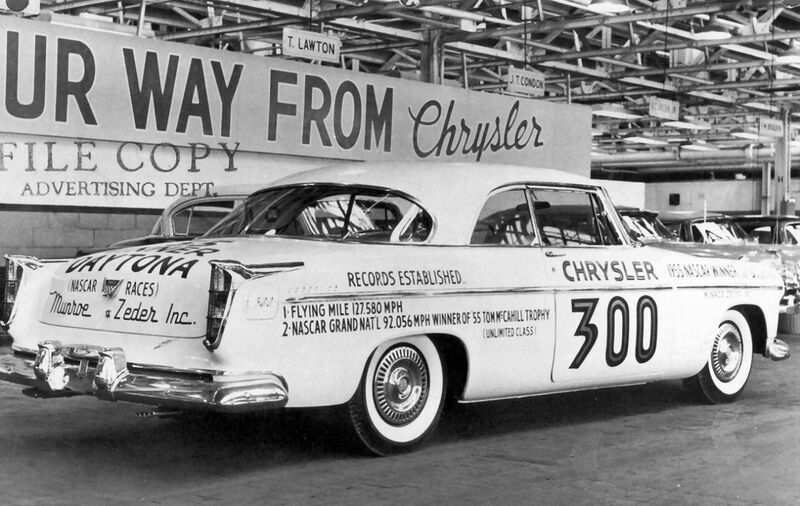 The C-300 was in reality a racing car built for NASCAR competition but sold to the public as a road car so Chrysler could meet homologation rules. The heart of the Chrysler C-300 was its 331 cu. in. (5.4 liter) FirePower Hemi V8 engine churning out no less than 300 hp and able to propel the 4,005lb automobile so quickly that a 150mph speedometer was needed. The “Batwing” air cleaner sitting atop the race specification 331 cu. in. (5.4 liter) FirePower Hemi V8 of the Chrysler C-300 is the most noticeable feature when opening the hood. The “Batwing” air cleaner covers two four barrel Carter carburetors. The servo assisted brakes were an optional extra. Chrysler’s Chief Engineer Bob Rodger and his team ensured that the FirePower Hemi V8 was not powerful just because of its size, nor simply because of its more efficient hemispherical combustion chambers. 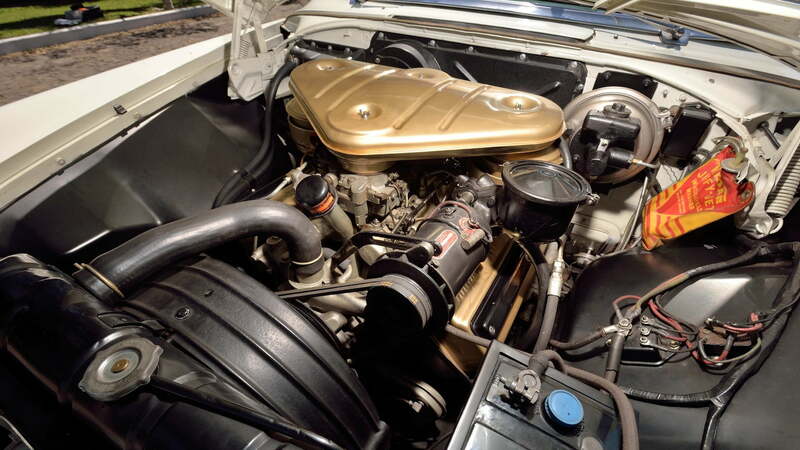 The engine’s compression ratio was raised to 8.5:1, the valve lifters were solid instead of the hydraulic ones normally used for Chrysler’s road cars so the engine could run at higher rpm, and the engine was fitted with a specially profiled racing camshaft. Feeding fuel-air mix from the 20.1 US gallon (76 liter) fuel tank into this gasoline hungry powerhouse were two Carter WFB 550-cfm four barrel carburetors sneakily hiding under a “Batwing” shaped air cleaner. All this meant that the engine’s idle was a tad “race car” rough, but it also meant that its acceleration was a tad neck muscle rough which was one of its main selling points. 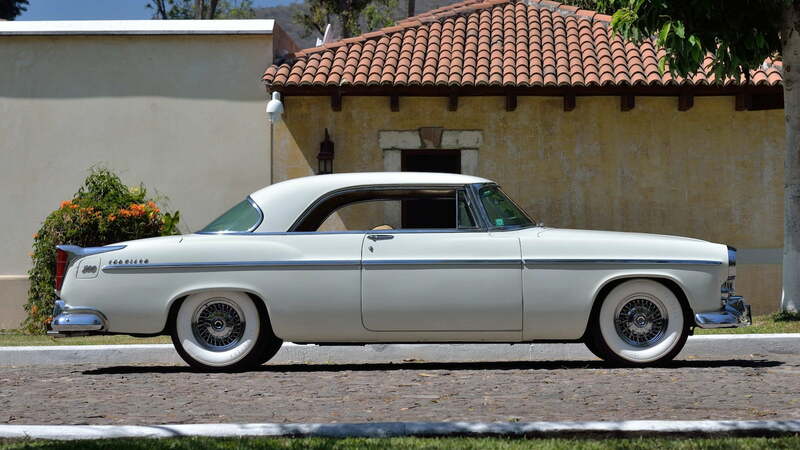 Chrysler stylist Cliff Voss blended together a design recipe that used a Chrysler Imperial front end, New Yorker mid-section coupé, and a rear section from the Windsor. Part of the C-300’s charm was that it was a bit of a “parts bin special” of Virgil Exner’s Chrysler Imperial with some New Yorker and Windsor mixed in. 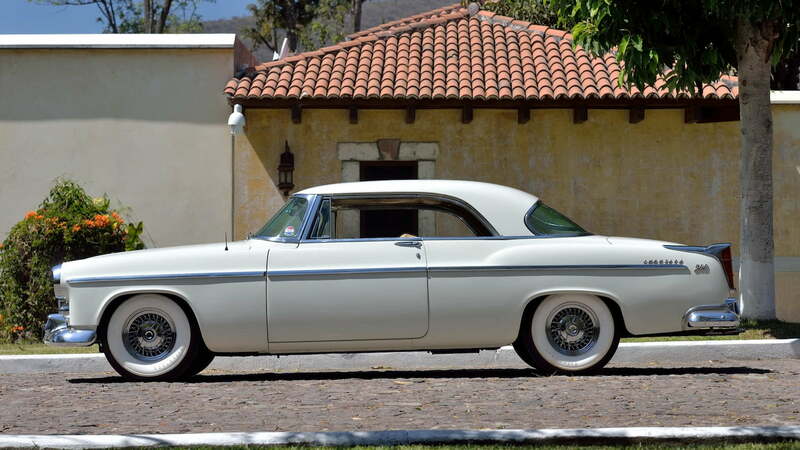 Chrysler stylist Cliff Voss used a mostly Exner Imperial front end with a mid-section coupé from the Chrysler New Yorker finished off with a rear section from the Windsor, and he somehow managed to cobble it all together to make one of the best looking American coupés of the 1950’s. Chrysler called the C-300 “America’s greatest performing motor car” and it could certainly give Chevrolet’s new Corvette a run for its money. The C-300 was a conventional 1950’s American car in terms of its engineering. The front suspension was independent with coil springs while at the rear were leaf springs and a live axle. Brakes were drums all around with servo assistance an optional extra. The car’s electrical system was 6 volt positive earth powered by a generator/dynamo which had twin belts to guard against electrical failure in the event of a broken belt. The transmission of the C-300 was a two speed Chrysler Torque Flite with the control lever mounted on the dashboard to the right of the steering column. Although a two speed gearbox may not sound like much in this day and age of six speed automatics bear in mind the C-300 was capable of 79 mph (127 km/hr) in first gear and 136 mph (219 km/hr) in second. In short it was fast enough to dominate NASCAR in 1955 and 1956 with top drivers Lee Petty and Tim Flock both driving C-300’s. The writing on this C-300 sums up 1955 pretty well: captions read “1955 NASCAR Winner”, “Flying Mile 127.580 mph” and “NASCAR Grand Nat’l 92.056 mph Winner of ’55 Tom McCahill Trophy”. 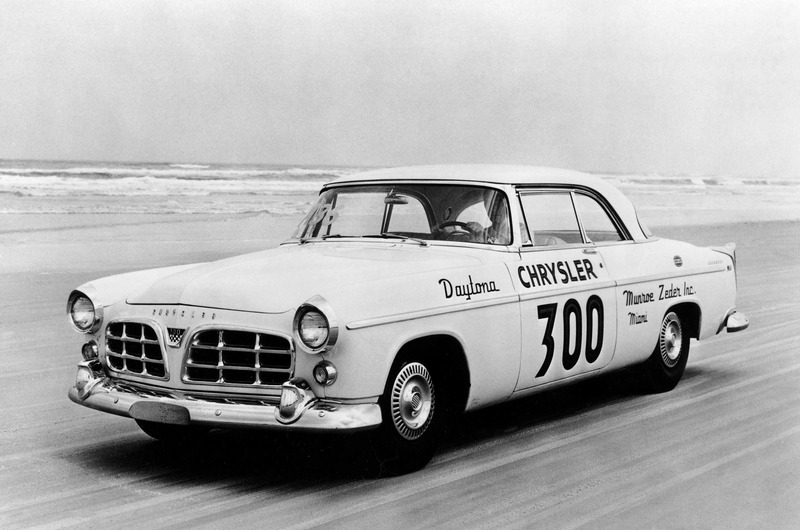 The Chrysler C-300 was the car that began Chrysler’s 300 “Letter Series” and it proved to be a great beginning. Automotive technology was rapidly developing back in that first decade after the end of the second world war, something we can appreciate when we realize that a radio was an optional extra in the car and the transistor Mopar model 914HR became the replacement for the valve radio in Chrysler cars in the fall/autumn of 1955, quite likely making the C-300 one of the first production cars in the world to be fitted with a transistor radio. 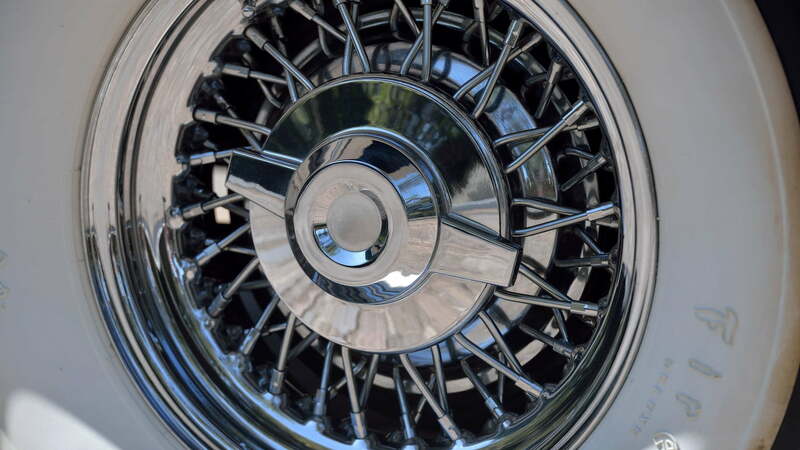 Wire wheels with spinner caps were an optional extra that give the car a sporting look and likely help ventilate the drum brakes. The C-300 was an expensive car back in 1955, costing USD$4,109.00 before adding optional extras such as wire wheels with spinner caps, heater/demister, power brakes or a radio. 1,725 were made of which only about 8% are believed to have survived: so if you have one rusting in a barn and having its genuine leather upholstery quietly being eaten away by hungry mice it might be worth dusting it off, installing a cat in the barn to eliminate the mouse problem, and seeing if you can find someone interested in resurrecting it. The C-300 might be a 1950’s design, but it has an element of timelessness about it. For those looking for one in nice condition Mecum Auctions have a white one coming up for sale at their Houston 2019 auction to be held over April 4-6. You will find the sale page for that car if you click here. 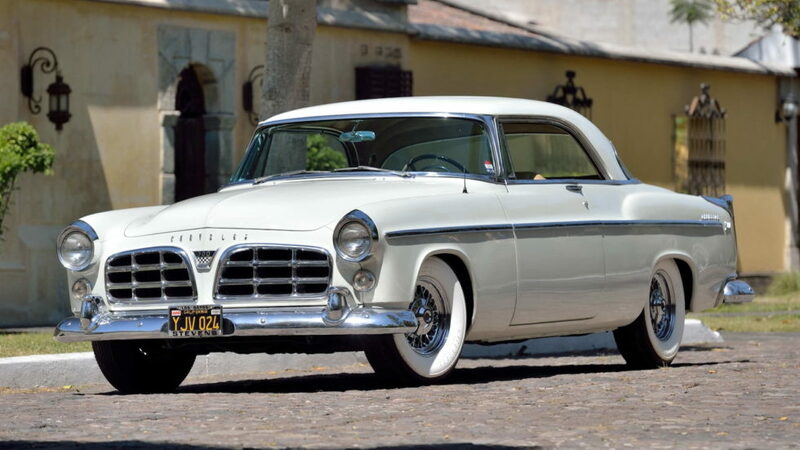 The Chrysler C-300 is regarded by many, this writer included, as one of the greatest American cars of the 1950’s. You could have your C-300 in one of three colors; white, red or black. The interior was genuine leather and it was very much a car for the gentleman who likes to engage in exciting driving in comfort, something the C-300 delivered in copious measure. Parts for the C-300 are pretty scarce nowadays, but the car remains one of the most interesting American automotive icons of the twentieth century. Photo Credits: Mecum Auctions, Chrysler.